Kydex sheath makes a positive lock to prevent take-away or drops. Remove knife by first wiggling then yanking the knife out. Knife is 100% Work Hardened 304 Stainless Steel that is resistant to salt and chemical corrosion. No need to ever oil the blade. Super flat design for optimized EDC and Tactical function. Remove handle plates for a skeletal knife, sheath still works. Make a breaker tool from the two handles. Leave the sheath on for a nonlethal self defense/enforcement tool. Breaker in the base is always accessible. Minimal tanto blade design for easy sharpening. 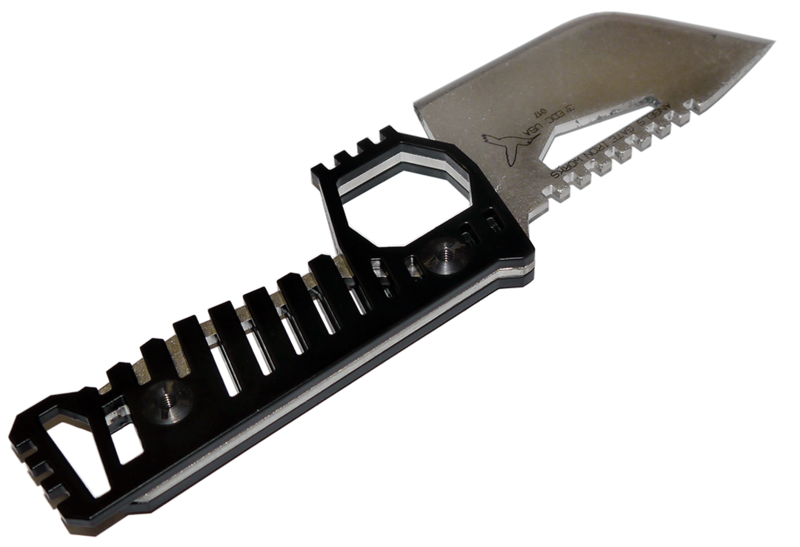 Strong safety features including front finger hilt, positive lock sheath, and rugged thumb grips on the blade. Each knife has its own serial number. Inital batch marked 001-080. Designed and made in the USA by Jesse Small.